The Hangleton and Knoll 50+ Steering Group held their 10th Anniversary Celebration Event this month at St. Richard’s Community Centre, Egmont Road, Hove . This year’s event was part of the Older People’s Festival (OPF), and was supported by the National Lottery Awards for All and the Eileen and Derek Dodgson Foundation. It was a great opportunity for older people to see just how much is available in Hangleton & Knoll. Over 200 people came and members from 20 local groups attended. 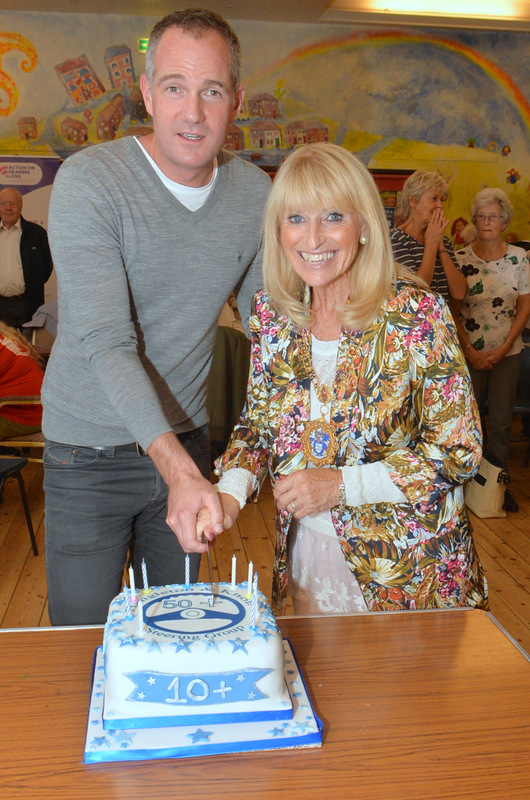 We were pleased to greet the Mayor, Councillor Dee Simson, and the local MP, Peter Kyle both of whom cut the anniversary cake. We have been helping older people in Hangleton & Knoll for 10 years, setting up new groups and supporting other 50+ groups in the area. The Event this year showcased many of the groups who provide so much enjoyment and friendship to the local community. In particular there were demonstrations from Cascadez Line Dancing, Singing for Better Health, Persian Dancing and SocialPing with the opportunity for anyone to dance-along, sing together and ping-along, and many did. There were stalls and demonstrations from Crafty Adults, the Benfield Wildlife, Men in Sheds, Multi-Cultural Women’s Group and many others. There was a tombola for which people had donated nearly 100 prizes as well as free tea, coffee and soft drinks and delicious cakes at a small charge.